Diagnosis and treatment of disorders of the nose and sinuses including nasal allergies, inflammatory diseases, acute and sinusitis, fungal sinusitis nasalpolyps, deviated nasal septum, disorders of the sense of smell, nasal injuries and fractures and benign and malignant tumors. Special clinical focus on pathologies affecting the skull base such as cerebrospinal fluid leakage and pituitary tumors. Functional Endoscopic Sinus Surgery (FESS) for chronic sinusitis, fungal sinusitis, nasal polyps, ablative minimally invasive endoscopic sinus surgery for tumors of the nose and sinuses, advanced endoscopic sinus procedures such as repair of encephaloceles and CSF leaks (prolapse of brain tissue in nose), surgery for pituitary tumors, endoscopic dacrocystorhinostomy (DCR) orbital decompression (for thyroid orbitopathy) and optic nerve decompression. Surgery for deviated septum such as septoplasty and functional septorhinoplasty. A/Prof. 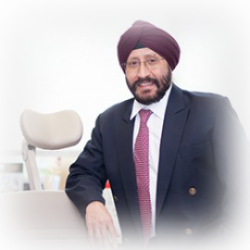 Dharambir S Sethi is an Ear, Nose, Throat (ENT) surgeon with over 25years’ experience in the field, providing specialised care for patients with nose and sinus disorders. Prior to establishing his private practice, A/Prof. Sethi was Senior Consultant of Otolaryngology at Singapore General Hospital, where he is still a Visiting Consultant. Otolaryngology and Head Neck Surgery and the Pioneer of ASEAN Rhinology Award from the ASEAN ORL Foundation. His contributions in sinonasal disorders and endoscopic sinus and skullbase surgery earned him Honorary Memberships with the South African Society of Otolaryngology & Head and Neck Surgery as well as the Malaysian Society of Otolaryngologist – Head & Neck Surgeons. In 2000, A/Prof. Sethi was featured in the Entrepreneurs of Singapore General Hospital. He has been a regular instructor at the American Academy of Otolaryngology and Head Neck Surgery since 1996, and has presented more than 50 instructional courses thus far. A much sought after speaker, A/Prof. Sethi has delivered over 700 scientific presentations in more than 18 countries around the world. A well-published surgeon, A/Prof. Sethi has more than 50 scientific papers to his name in peer-reviewed journals. He has also authored several book chapters and books. He currently serves on the Editorial and Review Boards of several scientific journals.